2 Red Hershey's Krackel or Hershey's Dark Choc. 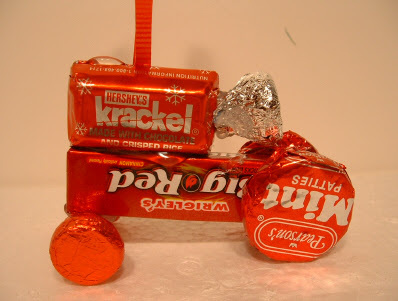 Hot glue the 2 Hershey's Krackel together (putting the ribbon on the inside of the two.) Then take the Big Red Gum and on the narrow end put some hot glue on the end so you can place the Hershey's Krackel on top for the motor. At the end of the Krackel, place some hot glue on the silver kiss and attach it to the krackel for the steering wheel. Then hot glue the 2 red kiss and attach to the bottom of the gum for the front wheels. Now put hot glue on the mint patties and attach to the back of the pack of gum for back wheels. The hot glue only takes a few minutes to harden. At Christmas time is when you can find the candy with colored wrappers. I got mine at Wal-Mart. You can also use the green candy foil for a John Deere tractor. Kids or farmers really like the tractor. It looks so real. A have also used this tractor for a favor. Looks so neat sitting on a table at the place setting. You can also make different colors of tractors. Copyright © 2007 by Barb. All rights reserved.